Evogen is a company that will pop up every so often in my Instagram discover feed, and make me stop and be like ‘what the heck is that!’. Whenever I see that icy blue color scheme I know immediately that it’s Evogen. But it’s a brand that can easily get lost in the shuffle. There are so many of these little speciality brands that sometimes you forget about some of them- just like Evogen. The Evogen story is that there’s a guy named the “pro-creator” and his name is Hany Rambod or something crazy like that and I’m too lazy to go look him up and/or get the proper spelling of his name. So for that I apologize. But not really. Anways, from what I remember this guy is a super knowledgable bodybuilding trainer and most likely has a crazy acumen with regard to pros trained and their respective accomplishments. What I don’t know about is if his products were all that great. That’s why I was actually super excited when BB.com sent me some of this Carnigen product. After I bought it for 30 bucks. Super affordable. But we’ll talk value later. First off let’s discuss the taste. What’s the Best Flavor of Evogen Carnigen? The best flavor of Carnigen is without a doubt the raspberry lemonade. I was able to try samples of the cherry limeade and also the watermelon flavors (from my friends tubs’), but I am happy to say that (of course) my flavor choice was the best with the raspberry lemonade. I’m going to do a brief description of how each flavor tastes so that you can decide for yourself which one would be best for you. Raspberry Lemonade (Best): I’m a lifelong ‘raz-lemonade’ fan so naturally this was the flavor that I chose for my tub of Evogen Carnigen. They did a nice job of balancing out the sweetness with the sourness in this flavor, and the results are quite tasty. I loved every sip of my Raspberry Lemonade Evogen Carnigen and I think you would find it really delicious even if you don’t fancy yourself as big a raspberry lemonade fan as I am. Watermelon (Second Best): Surprisingly I really enjoyed this flavor. It was not quite as good as the raspberry lemonade, but Evogen has done a nice job with their watermelon as well. What I like best about this flavor is that it does not taste super artificial and you get a very authentic taste of actual watermelon, which is rate for supplements with watermelon flavor. I don’t think you can go wrong with this flavor. It’s a little less sour than the Raspberry Lemonade. Cherry Limeade (Worst IMO): I say it’s the worst but honestly all three flavors are at least palatable. I think some companies have really done the cherry limeade flavor WELL (ie Pre Jym, Athena Intense), while others have more or less failed (C4 Ripped). This one is somewhere in between. I would have liked to see them add some more sweetness to this flavor, instead of making it more about the sour. But overall this one tastes ok. 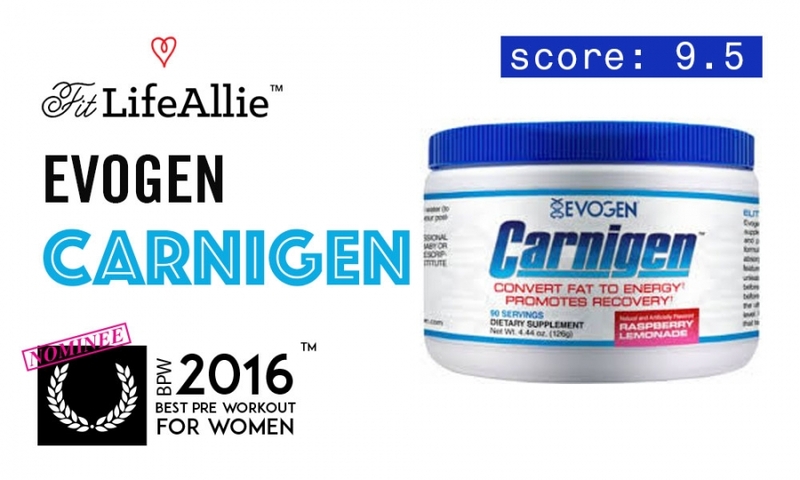 If you are looking to buy Evogen Carnigen you should still go with the watermelon or raspberry lemonade though. So overall I’m going to award a final flavor grade of 9.4 to Evogen Carnigen. Really a nice job all around. Let’s talk a bit about how this product performs. I would have to give Evogen Carnigen a performance grade of 8.9 on the performance. The only reason I am not giving it an ‘A’ is that I don’t think I have taken it long enough to be able to say without a shadow of a doubt, ‘yeah Carnigen is a super effective fat loss supplement’. I’ve taken it just about four or five times now (I can’t remember) and I must say that my cardio sessions have been strangely effective. Why the ‘strangely’? Well that’s easy. That’s because Carnigen is stimulant-free. If there’s a phrase that makes me shudder more than ‘stimulant-free’ I don’t think I’ve heard it. LOL. I mean. As you know from reading my pre workout reviews, (yes, this is my 60th one! ), I have an, er, problem. Like. I am only half kidding when I say that I run on coffee. If I don’t have it in the morning I am just not the same person. It’s a very real problem. Because what happens later in the day when it’s time to workout? You guessed it. Pre workout. More caffeine. I always dread that question from my doctor when I go in for checkups. ‘How many cups of coffee do you drink per day?’. Well, doc. That’s a great question. I probably consume the equivalent of 10 cups of coffee every single day. Super healthy. Not. LOL. But anyways. Evogen Carnigen is sitmulant-free. And believe it or not, I forewent (yes, that’s a word)(Silicon Valley, anyone? ), my pre workout to give Carnigen a real shot as a pre workout. As we’ll discuss in a second, this is mostly just a carnitine powder. So the fact that it actually was giving me those high-performance cardio workouts was pretty awesome. Other than just improving my workout quality, I can honestly say that I have noticed some added leanness and definition in my thighs, calves, and even my neck and shoulders. I would say my face and cheeks look a little bit leaner too, but I don’t want to jinx it, LOL. Hashtag image issues. I really do think Carnigen helped me achieve some of this added definition, though. There are some new lines starting to form on the outer calves that I didn’t have a week ago. Of course alot of this can be tied back to the high-intensity cardio that I’ve been doing (rowing, mostly), but I really do attribute some of these new improvements to Hany Rambod’s Evogen product. So what’s in here that would make it so effective as a fat loss supplement? What I like about this product is that it knows exactly what it is, and what it is not. As I mentioned before, some companies get so caught up with adding more and more ingredients to a product that they end up with a Franken-Supplement that is really stretched too thin to be effective. What I mean by that is, by the time they are done adding in ingredient after ingredient, the quantities of each one end up being too small to be effective at doing there job. On top of THAT, you have some added B-vitamins, and some Bioperine Black Pepper Extract to improve the uptake of the formula. But real quick, getting back to the carnitines. The all-time favorite of mine is the L-Carnitine L-Tartarate because it has actually been heavily researched and proven effective at burning unwanted fat. The Acetyl L-Carnitine is my second favorite and is responsible for some added stimulant-free energy and focus. Really, really good stuff. Ok. Let’s talk packaging. I don’t know why, but I am strangely drawn to Evogen’s packaging. Unlike Rev Labs (Ugh I was in such a bad mood when I wrote the Revburn review LOL), Evogen has really top-notch branding and a look that you just trust instantly. That type of trust is incredibly powerful in the dietary supplement industry when everyone is trying to fight over your dollar. The white, almost pearly finishes on the Evogen products make you think you are getting the very top of the line, upscale products. I do like how all the Evogen products share a consistent appearance with the whites and shades of blue. It all helps to reinforce the brand. The final thing I’ll touch on with regard to packaging is how nicely they’ve used contrast to bring your attention to critical elements on the label. Similar to PES High Volume, and even the PES Select Protein, Evogen has done a nice job making the flavor callout very prominent and presented in a way that makes you want to instantly rip the seal off and try the product out. The other area of contrast is on the front panel, beneath the ‘Carnigen’ product title, it says ‘Convert Fat to Energy, and promotes recovery’. It’s a minor detail, but I like how you look at the product and instantly are told what it is supposed to do. There are still products out there where you look at them, and have no idea what it is supposed to. Looking at you, Hypercor. LOL. Alrighty let’s wrap this thing up.